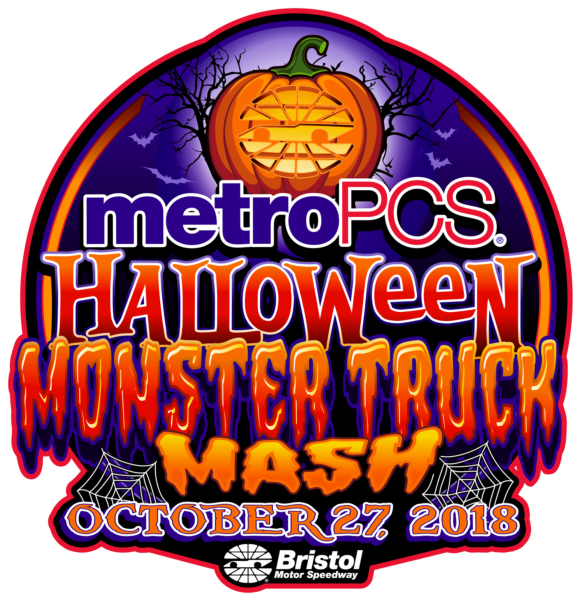 It's sure to be a graveyard smash as the Metro by T-Mobile Halloween Monster Truck Mash brings eight of the coolest monster trucks and the first trick-or-treat party of the year to celebrate the Halloween spirit at Bristol Motor Speedway on Saturday, Oct. 27. Monster trucks that will perform include Snake Bite, X-Termigator, Ice Cream Man, Black Stallion, Overkill, Buckshot, Tailgator and Predator. The eight trucks will compete in two disciplines: racing and freestyle, always a fan favorite. "We're looking forward to celebrating Halloween with some of the coolest monster trucks there are," said Jerry Caldwell, executive vice president and general manager at Bristol Motor Speedway. "Everyone should come and take advantage of the first trick-or-treat opportunity of the season by dressing up in their favorite costume and collecting treats in the infield." Fans should arrive early when the gates open at 1 p.m. for the Monster Truck Trunk or Treat Party, where kids are encouraged to dress in their Halloween costumes. All eight monster truck drivers will be available for meet and greets and will pass out candy to trick-or-treaters in the infield during the first trick-or-treat of the year. The pit party will also feature a best costume competition with great prizes. Visitors should also grab a seat for a ride in the Sasquatch monster truck bus at only $10 per person. "We are excited to be the title sponsor of this great family-friendly event at Bristol Motor Speedway," said Quinton Hoekstra, marketing manager at MetroPCS. "We are committed to serving the Tri-Cities region and this event gives us a great opportunity to share what a great wireless experience should look like. We look forward to seeing everyone at the speedway in October." The show will begin at 3 p.m. In addition to the monster trucks, the event will feature Bandit big rig racing and some of the most impressive jet-powered machines out there, including a jet dragster, jet outhouse and jet Polaris RZR. Fans can visit any participating Metro by T-Mobile store during the month of October to enter for a chance to win tickets to the event. On Friday, Oct. 26, the Bristol Metro by T-Mobile store at 971 Volunteer Pkwy will host a Monster Truck party. Additional details on the Metro by T-Mobile store appearance will be announced closer to the event. General admission tickets for this night of family fun are $20 ($25 day of) with advance purchase. Tickets for kids 12 and under are only $5. For more information and to purchase tickets, call 423-BRISTOL or visit http://bit.ly/2mg3rUR.